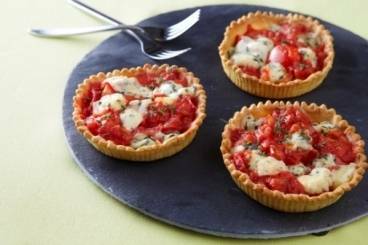 Shortcrust pastry tartlets made with tomato, garlic, thyme and fourme d'Ambert, a delicious blue cheese from France. Cut each sheet of pastry into 3 discs and press into individual 10-12cm tartlets cases. Line each tart case with baking parchment and then fill with baking beans. Bake for 10 minutes. Wash the tomatoes, remove the seeds and dice the flesh. Peel and finely chop the garlic. Pick the thyme leaves from the stalks. Cut the fourme d'Ambert into small pieces. Heat a frying pan and add olive oil. Add the tomatoes, half of the thyme and the garlic to the pan and cook for 5 minutes. Season with salt and pepper and remove from the heat once the tomatoes are soft and starting to break down. Drain any excess liquid from the pan. Spoont the tomato mixture on top of the pastry bases and sprinkle the blue cheese on top. Return to the oven and bake for 5 to 8 minutes to allow the cheese to melt. Sprinkle with the rest of the thyme to serve.